Tamaki-san withChiishi train the wrists, arms, knees & leds. Nobutaka is practicng Seiyunchin with Yasuyuki-san. Tamaki-san teaching Shisochi to Yahiro. Yahiro just has begun his Shisochin. Nanko sensei is satisfied with the record! We are the champions, my friends? The racing has just been started! Our is one with a red flag on the rear. This boat is called Sabani(small dragon fish boat). We race against other teams rowing this small boat. The Minei Dojo guys are ready for the race getting more and more excited! Here is the design of the back side of the T-shirt with Nanko Sensei in silhouette demonstrating Suparimpei. The guy in the T-shirt is Yasuyuki-san, the second boy of Nanko-sensei. Minei Dojo did a T-shirt for 2009 thanks to Tatsuro. Since last year, the design for the T-shirt had been talked about many times over. Once an idea was raised, it was modified over and over again. The emblem of OGKK is put on the front side of it. This is the second one just before the race. 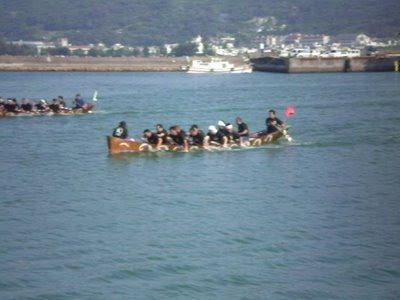 On May 31st, we took part in the Baten Hari(boat racing festival) at the Baten port in Tsuhako community in Sashiki Nanjo city. The group picture shown is the group one before the competition.